Apple opens their second store in New York City, a 20,000 square-foot shop at the underground concourse of the General Motors building at 767 Fifth Avenue. Open 24-hours a day, the shop is visible at street level through a 32-foot glass cube. 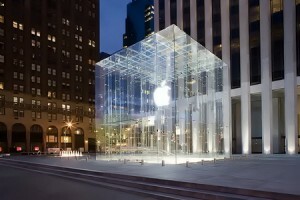 Designed by Apple’s CEO Steve Jobs at a cost of $9 million, people stood on line for hours prior to the store’s opening.